At one point or another, most of my clients ask me something about how my home looks. I usually say something along the lines of 'It's pretty organized, but I'm still human, so it's not perfect.' Well, I figured it would be even better to show you what my home looks like. 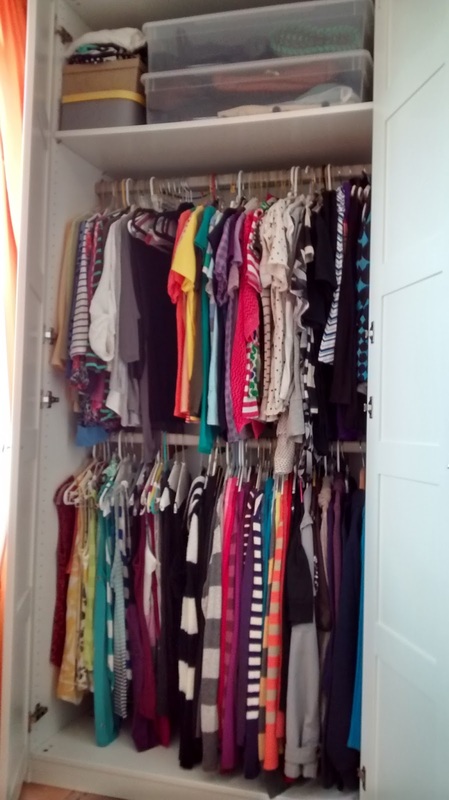 Let's take a look at my closet/wardrobe. The first wardrobe consists of all my hanging, short items. 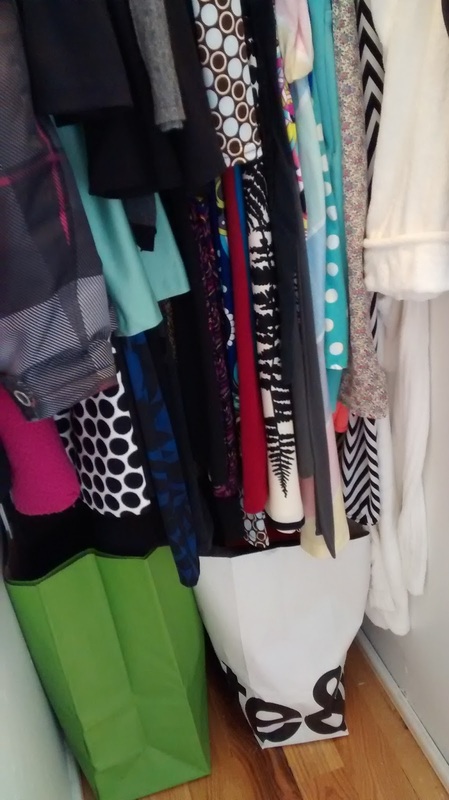 On the bottom rung, you'll find my sleeveless tops, long sleeved tops and cardigans/jackets. Above that are my 3/4 length sleeved tops, short sleeved tops and skirts. The top shelf has a couple different bins: out of season shoes, bags and mementos. Stacked above is my swimwear. Note that each category of clothing is color coded. them folded in opposite directions is an easy way for me to differentiate pants when I'm looking for a certain style in a rush. I don't have to flip through them all or try a bunch on to figure out which is which. 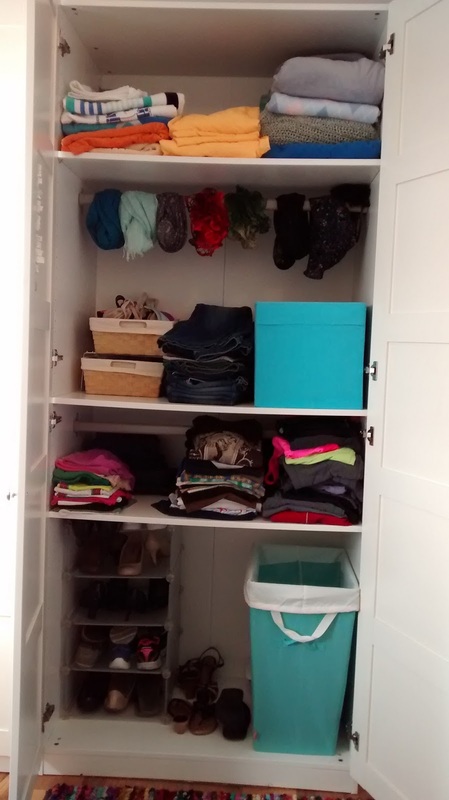 Next to the pants are a couple baskets above and below a stacking shelf. The bottom basket has underwear, the top has bras. Hanging above on an extra rod are fashion, not winter, scarves. The upper most shelf has linens of all kinds - beach towels, sheets, blankets. There is no other linen closet in the apartment! And, finally the only real closet in the apartment. Here I have my dresses and winter coats (when out of season). 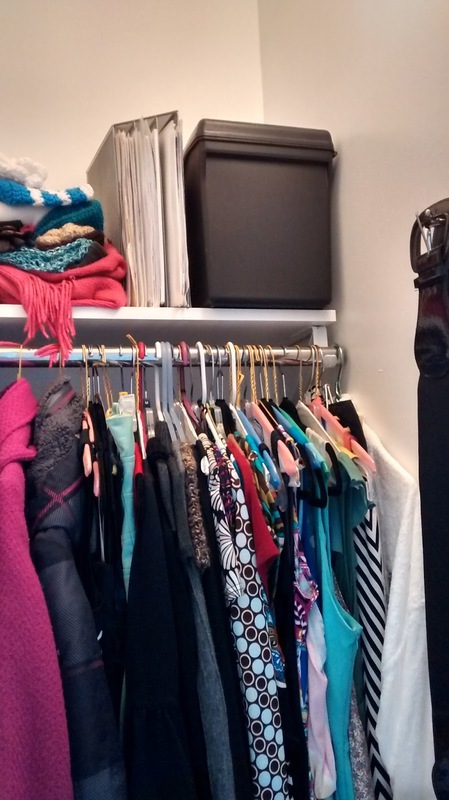 Above are winter accessories and an umbrella (there's also no other coat closet in the apartment). The black bin are my past years' taxes and the handful of files next to the bin are the only papers I have left to keep from transitioning to a paperless office years ago. There's a hook on the wall where I hang belts. Below are two bags of clothes that I've been adding to that will go to donation or a clothes swap. If something doesn't fit quite right when I try it on, into the bags it goes!